The site formed part of the historic former town gasworks and occupies an ‘L’ shaped area of approximately 0.35 hectares. The River Welland directly adjoins the southern boundary of the site. The area to the west of the site formed the remaining part of the town gasworks – this area has been remediated and is now occupied by a level car park owned by South Kesteven District Council [SKDC]. The areas to the east and north of the site are occupied by residential properties. The historical gas works is shown in Figure 1. The ‘L’ shaped area is outlined in red. A large gas holder existed in the centre of the site. The client had obtained planning permission to develop the site for the erection of 13 residential houses with private gardens and associated parking areas. The site had remained undeveloped for several years due to the identified contamination on site and the need to provide a cost effective and acceptable remediation solution to SKDC and the Environment Agency. The contaminants of concern reflected the historical usage of the site (as a gasworks) and included arsenic, lead, zinc, sulphate, cyanide, ammonia, total petroleum hydrocarbons and polycyclic aromatic hydrocarbons. Site investigations had shown that soil contamination was essentially concentrated in the western area of the site adjoining the SKDC Car Park (associated with the former Gas Purifier), in a localised area in the northern section of the site and within the large Gas Holder Base (almost certainly due to the Gas Holder void space being backfilled with contaminated materials on demolition). The underlying groundwater was also contaminated with gas works derived pollutants including dissolved / emulsified hydrocarbons, BTEX, naphthalene, phenols, cyanide and ammonia. 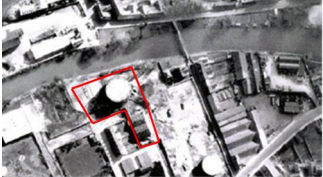 The groundwater contamination was predominantly located in the south western corner of the site and in the vicinity of the gas holder. The groundwater contamination appeared to extend under the adjoining car park area.